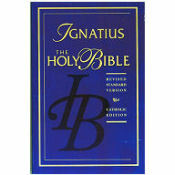 This is the only major modern translation of the Catholic Bible available in standard English. All other major translations have been revised to conform to feminist demands for "inclusive language" (the same language Rome rejected in the new Catechism). Acclaimed for decades as the clearest, most accurate and most beautiful modern translation of the Bible in English. Paperback (1272 pages). Be sure to get your Bible Tabs to make your studying easier.